Sculpture Size: 21.25 X 12.25 X 11 in. 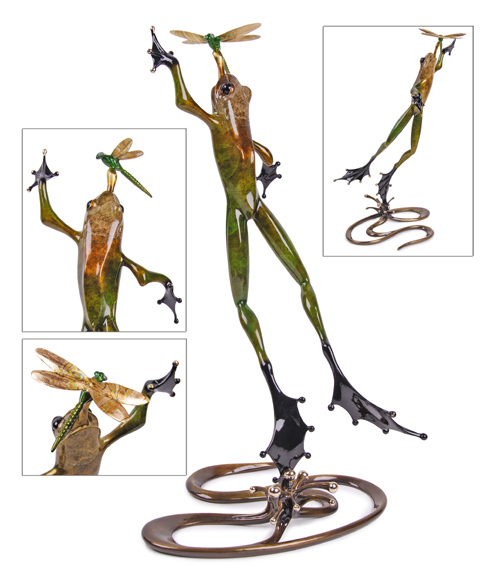 Bold, dynamic Frogman sculpture captures a frog in the act of jumping out of the water with a splash to nab a tasty dragonfly. Gorgeous coppery-bronze patina on the frog gradates down to a rich green on his legs. A stylized swirl of bronze forms the surface of the water--elegance and engineering from Tim Cotterill. "Quantum Leap" will make a dramatic statement anywhere in your home.